The World Economic Forum’s Global Risks 2013 report is developed from an annual survey of more than 1,000 experts from industry, government, academia and civil society who were asked to review a landscape of 50 global risks. The global risk that respondents rated most likely to manifest over the next 10 years is severe income disparity, while the risk rated as having the highest impact if it were to manifest is major systemic financial failure. 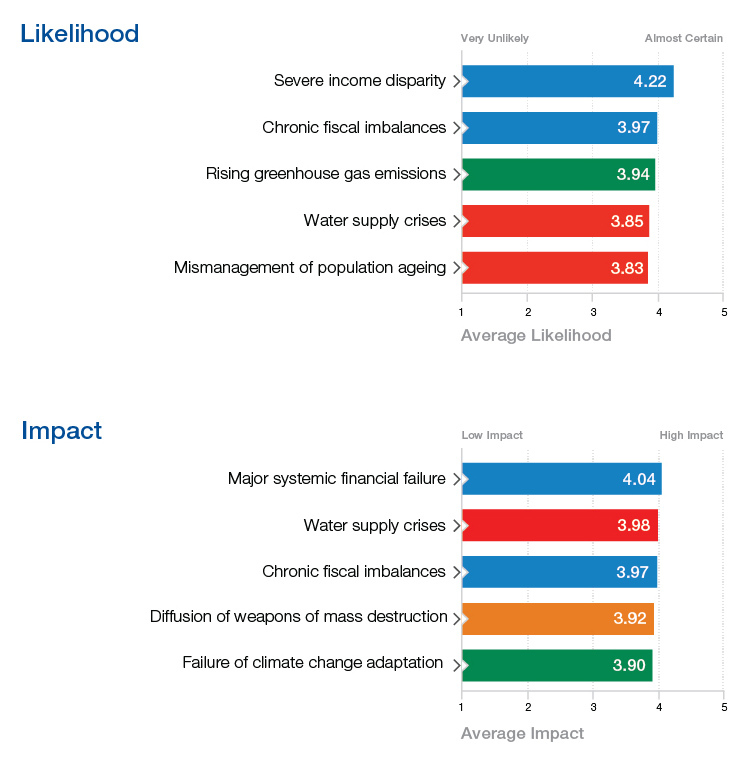 There are also two risks appearing in the top five of both impact and likelihood – chronic fiscal imbalances and water supply crisis (see Figure 4). 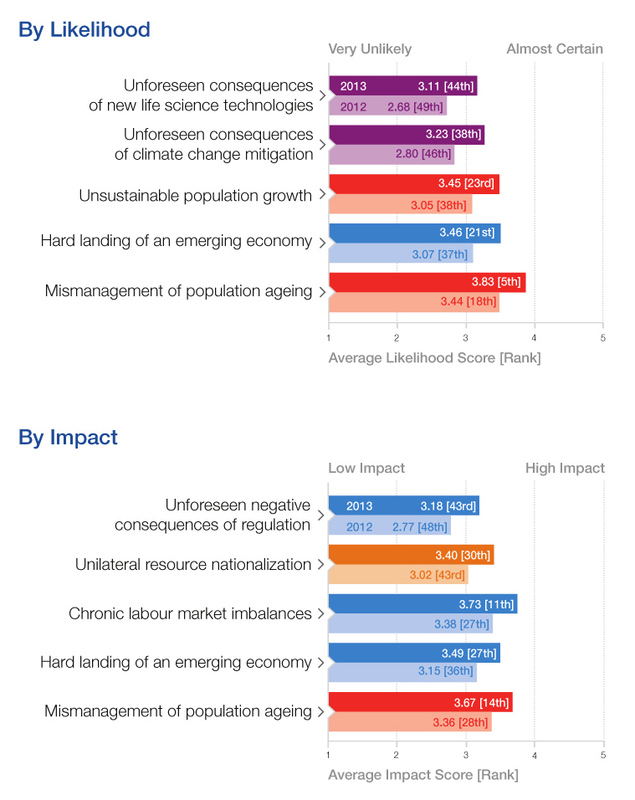 Unforeseen consequences of life science technologies was the biggest mover among global risks when assessing likelihood, while unforeseen negative consequences of regulation moved the most on the impact scale when comparing the result with last year’s (see Figure 5). Continued stress on the global economic system is positioned to absorb the attention of leaders for the foreseeable future. Meanwhile, the Earth’s environmental system is simultaneously coming under increasing stress. Future simultaneous shocks to both systems could trigger the “perfect global storm”, with potentially insurmountable consequences. On the economic front, global resilience is being tested by bold monetary and austere fiscal policies. On the environmental front, the Earth’s resilience is being tested by rising global temperatures and extreme weather events that are likely to become more frequent and severe. A sudden and massive collapse on one front is certain to doom the other’s chance of developing an effective, long-term solution. Given the likelihood of future financial crises and natural catastrophes, are there ways to build resilience in our economic and environmental systems at the same time? In 1938, thousands of Americans confused a radio adaptation of the H.G. Wells novel The War of the Worlds with an official news broadcast and panicked, in the belief that the United States had been invaded by Martians. Is it possible that the Internet could be the source of a comparable wave of panic, but with severe geopolitical consequences? Social media allows information to spread around the world at breakneck speed in an open system where norms and rules are starting to emerge but have not yet been defined. While the benefits of our hyperconnected communication systems are undisputed, they could potentially enable the viral spread of information that is either intentionally or unintentionally misleading or provocative. Imagine a real-world example of shouting “fire!” in a crowded theatre. In a virtual equivalent, damage can be done by rapid spread of misinformation even when correct information follows quickly. Are there ways for generators and consumers of social media to develop an ethos of responsibility and healthy scepticism to mitigate the risk of digital wildfires? Health is a critical system that is constantly being challenged, be it by emerging pandemics or chronic illnesses. Scientific discoveries and emerging technologies allow us to face such challenges, but the medical successes of the past century may also be creating a false sense of security. Arguably, one of the most effective and common means to protect human life – the use of antibacterial and antimicrobial compounds (antibiotics) – may no longer be readily available in the near future. Every dose of antibiotics creates selective evolutionary pressures, as some bacteria survive to pass on the genetic mutations that enabled them to do so. Until now, new antibiotics have been developed to replace older, increasingly ineffective ones. However, human innovation may no longer be outpacing bacterial mutation. None of the new drugs currently in the development pipeline may be effective against certain new mutations of killer bacteria that could turn into a pandemic. Are there ways to stimulate the development of new antibiotics as well as align incentives to prevent their overuse, or are we in danger of returning to a pre-antibiotic era in which a scratch could be potentially fatal? This year’s Special Report examines the difficult issue of how a country should prepare for a global risk that is seemingly beyond its control or influence. One possible approach rests with “systems thinking” and applying the concept of resilience to countries. The report introduces five components of resilience – robustness, redundancy, resourcefulness, response and recovery – that can be applied to five country subsystems: the economic, environmental, governance, infrastructure and social. The result is a diagnostic tool for decision-makers to assess and monitor national resilience to global risks. Runaway climate change: Is it possible that we have already passed a point of no return and that Earth’s atmosphere is tipping rapidly into an inhospitable state? Significant cognitive enhancement: Ethical dilemmas akin to doping in sports could start to extend into daily working life; an arms race in the neural “enhancement” of combat troops could also ensue. Rogue deployment of geoengineering: Technology is now being developed to manipulate the climate; a state or private individual could use it unilaterally. Costs of living longer: Medical advances are prolonging life, but long-term palliative care is expensive. Covering the costs associated with old age could be a struggle. Discovery of alien life: Proof of life elsewhere in the universe could have profound psychological implications for human belief systems. iii *The survey methodology changed significantly after the 2011 report. In contrast to the years 2007 to 2011, the list of 50 risks that was assessed by the survey did not change in 2012 and 2013.